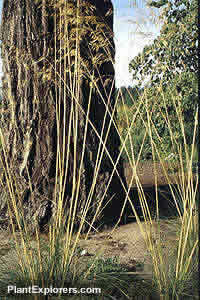 This evergreen or semi-evergreen perennial grass gets the designation 'Giant' not for its leaves, which form a tidy hummock 30-60cm around (1-2 feet), but for the seed heads, which can reach 2-2.5m (6-8 feet) in height. Although this height may seem imposing, this grass is has a delicate, almost transparent, look that is suitable even in smaller gardens. For maximum freshness, please keep seed refrigerated in its original packaging until it is time to plant. Sow seed in containers in a cold frame in spring. Grow in moderately-fertile, light well-drained soil in full sun. Remove dead leaves in early spring.